Shades of Soul are delighted to announce the inaugural London Blues Festival this year from 15-22 May 2011.The festival will be held at a number of venues throughout the capital and will endeavour to highlight the extraordinary talent both here in the UK and internationally. We intend to make it a major annual music event, expanding its scope every year. It is the only genuine Blues Festival in London and we are extremely pleased with the support we are receieving including from John Mayall, Blues in Britain, Blues Matters, and a host of London venues as well as the Blues musicians fraternity. The LBF is intended to support the renaissance of the Blues and develop further its profile and popularity.As curators the Festival will seek to feature the full range of the Blues genre and in particular some of the best up and coming bands in the country. Apart from live shows the Festival will also host a number of seminars with the Institute of Contemporary Music. 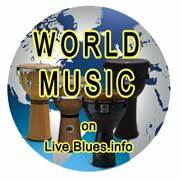 Marcus Malone, 24 Pesos, Marcus Bonfanti, Earl Green, BluesMix and a host of UK and international blues talent! Further acts will shortly be announced.